It’s nice to be reminded every once in a while why I actually love reading fantasy. The adventures of Vlad Taltos came highly recommended by a colleague and rightly so. One of the misgivings I have when deciding on a new fantasy series (and they almost always come as such) is that each book is longish (to say the least) and once you commit, you need to end the series otherwise you forget most of what you read by the time you decide to start again. Not to say that some authors take their time constructing the world and it takes some serious patience to get through that. So, imagine my surprise on reading this book and getting instantly immersed in a new world that gets more painted through the discussions of characters than by long descriptions. Each page brings another thread in the tapestry of this new world and it doesn’t feel at any point that you are missing information regarding this new world where you’re off on a book adventure, but everything sort of falls into place. And even the questions that remain regarding the world Mr. Brust created are not important ones, just those that will add several more threads. Another good thing is that you get a basic introduction into the world of Vlad Taltos and then we’re off on an adventure with him. 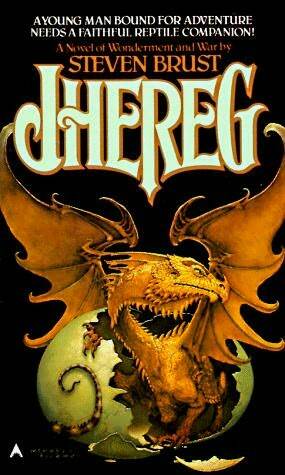 I already started reading the second book that chronologically happens before the story of Jhereg but in truth, you need to read Jhereg first because that is where the beginnings of Vlad’s story start. The second book fills a bit of the story from his beginning as an assasin and how he came to be what he was in the first book (but more on that once I finish book two). What I really enjoyed in the story is the fact there is a lot intrigue, fun conversations, a relatively lax view of murder (but a really intriguing solution why that is so) and the introduction into this world of sorcery and witchcraft (not the same), humans and Dragaerans, assasins, familiars, etc. This adventure ends with this book and you aren’t forced into reading several other 400 and more paged books in order to get to the bottom of the story and a clear ending. Yet, upon finishing it, you will want to embark on the next Vlad adventure because they are both fun and uncoerced. I love fantasy, especially high fantasy, and I think it's awesome that you do too! This series sounds rad—-and since I recently finished a great trilogy, I'm ready for a new one. Friday is library day at my house!